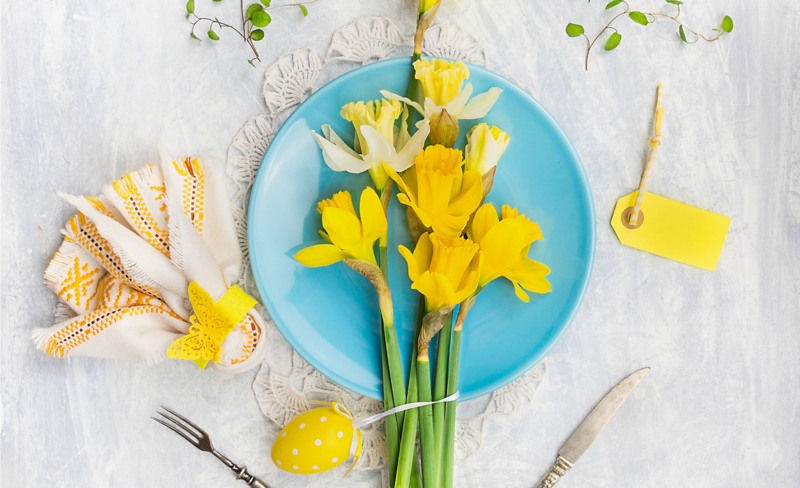 Most years, I can’t wait to set my Easter table and I google and fret and fuss over just the right menu items for brunch and the perfect chosen Spring delight for the Easter baskets. And then there are the years that I scramble up from the sofa at 11pm on the Saturday night before the big day to pull tangled Easter grass out of the attic only to learn I’m one basket and five gifts short. So, I improvise and use the basket that’s been holding my make-up as the stand in for the real thing and put left over Christmas candy in the eggs. If they’re lucky, one of us has cash and stuffs a few plastic eggs with money. Life is hard and also wonderful, especially those jam-packed holiday weeks. This year feels heavier and more burdened than most. There’s hurt and tragedy and worry in every direction. But at the same time, I see the true joy in it more than I ever have—evil is strong but good is stronger, fear is paralyzing but love still frees. Easter may feel like it’s a world away, but it isn’t. It’s here now, even on Wednesday of Holy Week and on the darkness of Good Friday and on the days when you feel that the hopelessness of life will swallow you up. The Easter feast is here and it is for you. The table is set and the One serving this meal never forgets the details. This meal is not an afterthought. It is not what He cobbled together from a stash of leftovers. This meal is why He came. And this table is your Easter promise—the feast He’s been planning before the foundation of the world. The Easter feast is here and it is for you. This table is for you. I don’t know what your wounds are, but I imagine they are deep and wide. Mine can still choke off my breath and leave me with nothing but heartache and confusion. This table is for us. Come to this table—where you will finally be known, where you will be welcomed and cherished, where you will drink the elixir of life and Life will be yours forever. Make no mistake, weary soul. Your Father in heaven loves you. He comes to you with peace and forgiveness and it’s His love that makes you whole and worthy and beautiful. He invites you to His beautiful, spacious table, where He offers His own body and blood for your life and salvation. He accepts you just as you are, meets you right in your need. There is nothing you could do to make Him change His mind. He loves you and He has given everything to get you here. He has always done His greatest work at life-changing meals and today is no different. He has a place ready just for you. Your name is written down. Your hurts will be healed. Your objections will all be answered. This is where He feeds you life-giving food that will never perish or spoil. This is where He makes you whole. This is where Mystery and Sacred dance, where Wine is forgiveness and Bread is life. This meal will change everything. Truly beautiful, Edie. Happy Easter! I stumbled across your blog after typing into Google “why is marriage so hard”. I really find comfort and truth in your words. This one made me cry. Amen, amen and amen, thank you, just beautiful. This one brought sweet tears to my eyes.how often we need to hear of His great love. Absolutely beautiful! So enjoyed the Prodigal Son Lent devotional. I don’t know why I never saw it as our story of returning to the arms of the loving Father. You have such a gift for addressing the hurting hearts of the wounded and weary. Have a joyous and blessed Easter. Thank you so much for sharing; thoughtful and beautiful. Yes, the Lord is good ! Happy Easter ! needed this today! Ready to have him bind the wounds! Your gift of writing is such a blessing to this hurting and broken world. Thank you for sharing– this was exactly what I needed to hear today! Blessings on your Holy Week and Easter celebrations!